Cactus pads add an exotic touch to soups, stews and other dishes. 1 Can You Freeze Nopales? "Nopales" is the Mexican name for the pads of the prickly pear cactus. These pads can be eaten fresh, boiled or grilled, and even canned, pickled or packed in syrup. Nopales are described as tasting similar to tart green beans, okra, or green bell pepper, and are a good source of calcium and vitamin C. They are a versatile addition to several dishes, but some preparation is required. 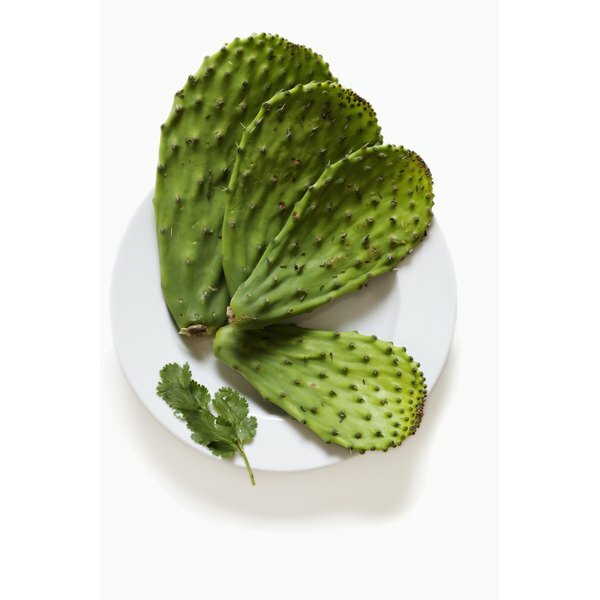 Choose nopales that are glossy, deep green and no more than 1/2 inch thick. Larger pads are tougher. Wear household gloves to protect your hands from the cactus spines. Cut out any spines with a paring knife. Scrub the nopales gently with a clean vegetable brush under running water to remove the protruding nodes, which are the beginning of new spines. You may also use a vegetable peeler to slice off the nodes. Trim around the entire edge of the pad with a paring knife, removing no more than 1/4 inch from the surface. Cut parallel slices in the prepared cactus pad from the round end toward the base, about 1/3 inch apart. Do not cut all the way through the base. The cactus pad will resemble a fan. Brush the pads with olive oil and season with salt and pepper. Cook over medium-high heat, using a cast-iron pan or an outdoor grill, until each side of the cactus pad is soft, slightly charred and yellow-green. Cut the prepared cactus pads into strips about the width of a French fry. Boil water in a pot large enough to hold the sliced cactus pads. You will need enough water to cover the prepared strips. Add 1/2 tsp. salt per gallon of water, then add the raw cactus pad strips. Boil the cactus strips, uncovered, for about 10 to 15 minutes or until tender. The water may start to foam because of the thick juice in the cactus strips. Drain the cooked cactus strips and rinse with cool water. The cactus can be served this way or diced and added to other recipes. Alicia Turner has worked in journalism for more than 20 years. She has served as a reporter for publications such as the "Roanoke Times" and the "Tallahassee Democrat," covering local politics, transportation and education. Turner holds a Bachelor of Science in journalism.